Please watch the video in class. Take notes on the Earth Revealed Disc #15 disc Weathering and Soils. Please circle each of the Chapter 4 vocabulary words discussed in the video. When the film is finished and after reading Chapter 4:Weathering, Soils, and Mass wasting finished, write questions with answers that a student should be able to answer if she/he viewed this video. You should have at least two or more questions for each chapter. List the most significant discovery you made about Weathering and Soils which you did not know before watch the film. Concept 1: Define and describe the processes of weathering and erosion, including examples of negative and beneficial effects of these processes. Concept 2: Use examples to explain the difference between mechanical and chemical weathering and the variation in the rate of weathering. Concept 3: Discuss soil composition, texture, structure, formation, and classification. Concept 4: Provide examples of various types of mass wasting and describe the controls and triggers of this process. The following statements summarize and describe many of the key terms and concepts presented in the chapter. · External processes include (1) weathering—the disintegration and decomposition of rock at or near the surface, (2) mass wasting—the transfer of rock material downslope under the influence of gravity, and (3) erosion—the incorporation and transportation of material by a mobile agent, usually water, wind, or ice. They are called external processes because they occur at or near Earth's surface and are powered by energy from the Sun. By contrast, internal processes, such as volcanism and mountain building, derive their energy from Earth's interior. · Mechanical weathering is the physical breaking up of rock into smaller pieces. Chemical weathering alters a rock's chemistry, changing it into different substances. Rocks can be broken into smaller fragments by frost wedging, unloading, and biological activity. Water is by far the most important agent of chemical weathering. Oxygen in water can oxidize some materials, while carbon dioxide (CO2) dissolved in water forms carbonic acid. The chemical weathering of silicate minerals frequently produces (1) soluble products containing sodium, calcium, potassium, and magnesium, (2) insoluble iron oxides, and (3) clay minerals. · The rate at which rock weathers depends on such factors as (1) particle size—small pieces generally weather faster than large pieces; (2) mineral makeup—calcite readily dissolves in mildly acidic solutions, and silicate minerals that form first from magma are least resistant to chemical weathering; and (3) climatic factors, particularly temperature and moisture. Frequently, rocks exposed at Earth's surface do not weather at the same rate. This differential weathering of rocks is influenced by such factors as mineral makeup and degree of jointing. · Soil is a combination of mineral and organic matter, water, and air—that portion of the regolith (the layer of rock and mineral fragments produced by weathering) that supports the growth of plants. Soil texture refers to the proportions of different particle sizes (clay, silt, and sand) found in soil. The most important factors that control soil formation are parent material, time, climate, plants and animals, and topography. · Soil-forming processes operate from the surface downward and produce zones or layers in the soil called horizons. From the surface downward the horizons are designated as O, A, E, B, and C, respectively. · In the United States, soils are classified using a system known as the Soil Taxonomy. It is based on physical and chemical properties of the soil profile and includes six hierarchical categories. The system is especially useful for agricultural and related land-use purposes. · Soil erosion is a natural process; it is part of the constant recycling of Earth materials that we call the rock cycle. Rates of soil erosion vary from one place to another and depend on the soil's characteristics as well as such factors as climate, slope, and type of vegetation. Human activities have greatly accelerated the rate of soil erosion in many areas. · Weathering creates mineral deposits by concentrating metals into economically valuable deposits. The process, called secondary enrichment, is accomplished by either (1) removing undesirable materials and leaving the desired elements enriched in the upper zones of the soil or (2) removing and carrying the desirable elements to lower soil zones where they are redeposited and thus become more concentrated. Bauxite, the principal ore of aluminum, is one important ore created by secondary enrichment. · In the evolution of most landforms, mass wasting is the step that follows weathering. The combined effects of mass wasting and erosion by running water produce stream valleys. Gravity is the controlling force of mass wasting. Other factors that influence or trigger downslope movements are saturation of the material with water, oversteepening of slopes beyond the angle of repose, removal of anchoring vegetation, and ground vibrations from earthquakes. · The various processes included under the name of mass wasting are classified and described on the basis of (1) the type of material involved (debris, mud, earth, or rock), (2) the kind of motion (fall, slide, or flow), and (3) the rate of movement (fast, slow). The various kinds of mass wasting include the more rapid forms called slump, rockslide, debris flow, and earthflow, as well as the slow movements referred to as creep and solifluction. What happened to Cleopatra's Needle? Why does rock material change when exposed to surface conditions? Describe exfoliation, and the fracturing of rock due to pressure release. How do mechanical and chemical weathering work together to disintegrate rock? What are the principle agents of chemical weathering? How does rain water become acidic? How do climate and temperature affect the rate of weathering? Discuss the formation of acid rain and its impact on surface materials. Discuss the formation of soils and soil horizons. What circumstances led to the Dust Bowl of the 1930's? How do irrigation practices affect the long term health of soils? What have you seen blowing away from the equipment in every scene during the last 10 minutes of this episode? Why is soil one of our most important natural resources. Anyone undertaking a building project must understand mass wasting — the down slope movement of earth under the influence of gravity. Various factors in mass wasting, including the rock’s effective strength and pore spaces, are discussed, as are different types of mass wasting such as creep, slump, and landslides. Images of an actual landslide illustrate the phenomenon. Why does mass wasting occur everywhere? How do human activities help trigger mass wasting events? Describe how the angle of a slope affects mass wasting. 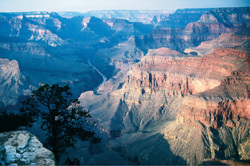 Describe how water in the ground contributes to mass wasting. What is creep, and what causes it to occur? Discuss landslides at Portuguese Bend. How has road building contributed to the problems? Why are many Portuguese Bend landowners unable to move? Discuss mudflows and debris flows. What factors do engineering geologists look at when studying slope stability? How do heavy rains contribute to mud and debris flows? How does human activity contribute to mass wasting processes?